I have a fairly small garden at home. However, you don’t need to have acres of space covered in flowers in order to help the bees. The trick is to make the best of what you have got. If all you have is a balcony, use hanging baskets and pots. I once saw a wall covered in hanging baskets filled with flowers. Even a vertical wall can be turned into a feeding station for bees! So yes, it’s not always the amount of space you have, but what you do with it that counts. Small spaces can provide habitat and food for bees if that is what you set out to do, and they can play their part in helping to link habitats together, providing 'bee feeding stations' for hungry bees. However, I also recommend that if you only have a small garden or yard, create something you too will enjoy! It's perfectly possible to achieve both - they are not mutually exclusive! The image at the top of this page is of a small informal flower patch I created by deliberately planting some flowers and bulbs, but also throwing a mixture of seeds onto the ground. I really like this informal look, but actually, a formal garden, if planted with good nectar and pollen plants, can also be effective as long as you leave out the chemicals. I have a curving border as well, planted with hardy geraniums, cornflower, daisies, lavender and more, but also miniature fruit trees (plumb, pear, apple) - not visible in the image below. 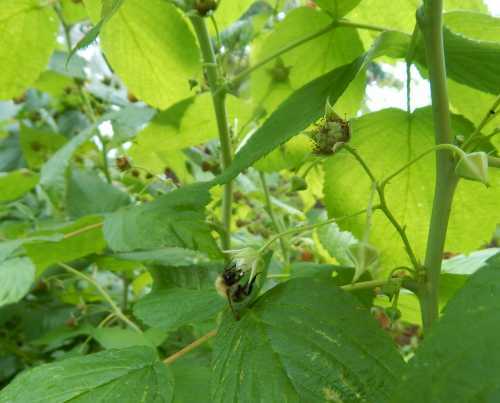 We have a patch of raspberries too (below) - summer and autumn varieties mixed together. They get covered in bees (the wasps help out too) and we get lots of fruit! Create areas or small zones within the garden if you can, because this will add interest. Small zones could include perhaps an informal flower patch, a fruit/vegetable area, a border. Ours contains a rockery too. All of these, including the fruit and veg patch, can be helpful to pollinators - or you could carefully plant fruit and veg crops into your border. It can be tempting to created narrow borders at either side of a small space and assume you have no room for anything else, except a path running up the middle. But on paper, why not plan a few features into your garden instead, imagining how it will look if you weave borders in and out, with miniature wildlife and bee and pollinator friendly zones. Grow up as well as down to maximise space. Climbers can grow up arch ways, through trees, and up drain pipes. Choose an appropriate climber for your circumstances, and ensure the supporting structure is strong enough. Bees love honey suckle, jasmine, passion flower, old fashioned climbing roses, wisteria. Fruit trees can be trained to grow against a wall. We have climbing beans growing from a pot and against an arch some years. Try to ensure long flowering seasons, and remember that some spring flowers and bulbs will die back. Their space can then be taken or covered by a spreading plant such as geranium, which will flower later. I have sprawling geraniums. In early spring, the crocus, muscari, daffodils and snow drops flower, then die back, but are eventually covered by the geranium leaves and flowers. Shrubs can again grow upwards and create efficient foraging, as can miniature trees as stated. You could also experiment with 'standard specimens'. Consider using hanging baskets, pots and window baskets. Hanging basket can even be hung from trees if they are not too heavy and there is sufficient light. Include a solitary bee houses in your garden. A bird box may provide a home for some bumblebee species. Remember, even a small lawn patch can help bees! Allow clover to flourish in a small patch of lawn. A small wildlife pond is also useful. A muddy bank can provide much needed nest building materials for mason bees, and the pond can be filled again with plants bees like, such as iris and mimulus guttatus. If you have a small front garden, use that too! Beach aster, sedum, various creeping, flowering sempervivums, and flowering shrubs are enjoyed by bees in our small front patch. For interest, you could keep an area where you can sow with interesting annual flowers that bees like, perhaps on an informal basis. 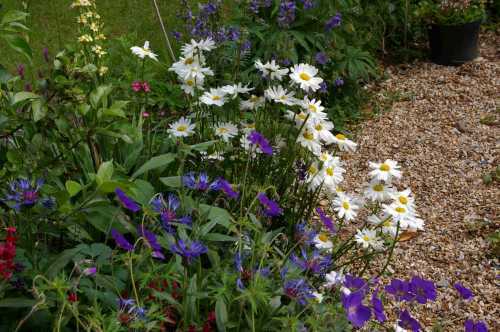 Include wildflowers loved by bees in your border or flower patch. We have dandelions here and there, hedge woundwort (though I must warn you - it spread quickly! ), purple loosestrife (invasive in some countries if it gets into the waterways, but not here), poppy, fox glove, forget-me-not, cornflower, selfheal, bird’s foot trefoil, clover and ox-eye daisy. If you are wanting to grow food, consider beans, corgettes, peas and also fruits (rasoberries, blackberries, blueberries are some of the best in my view), and allow some of your vegetable plants to flower, such as onions. 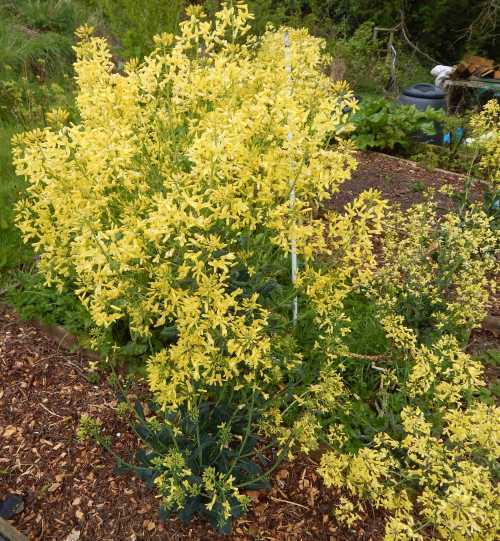 Kale is superb when it flowers, and attracts many bees - I LOVE it! It grows quite tall, and carries fragrant yellow flowers. Below is a picture of the kale growing in our allotment. We harvested from it from last year until early spring, and then allowed it to flower. It's possible to harvest a few leaves even whilst flowering. Bees enjoy foraging on the mass of flowers! make sure you also love your outdoor space! For several years, I experimented by leaving our garden to ‘go wild’. I allowed wildflowers to pop up, and wild grasses, and attempted to establish a few plugs and seeds. I used to mow a ‘path’ through my ‘meadow’ every so often. However, whilst it can work very well in some circumstances, what was the result for us? A small space we ourselves could hardly use and enjoy. Mostly low-value grasses, not many wildflowers became established. 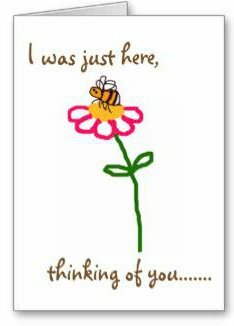 Very few bees – in fact, hardly any! Since I turned our garden into a space we could enjoy, including lots of plants loved by bees, we enjoy our garden far more, have fresh produce, AND we have more bees and other wildlife visitors in the garden! We are also organic, of course. 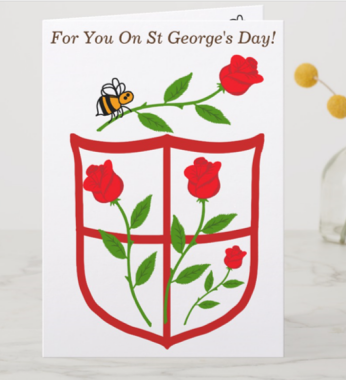 I wrote more about my personal experience on my page which features a downloadable, free PDF about planning a bee-friendly garden. So the lesson is, make the best of what you have. 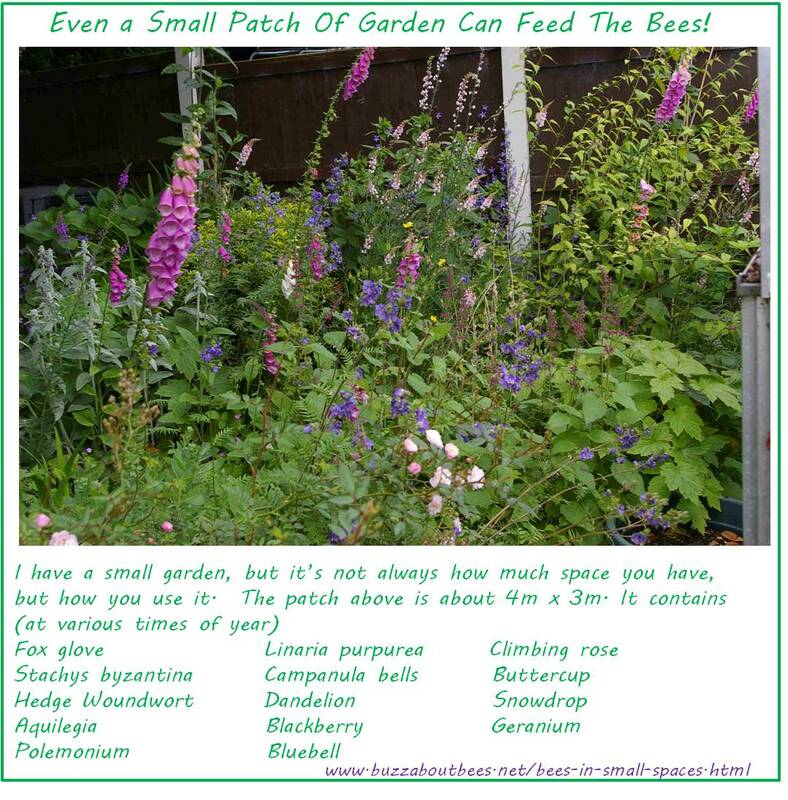 You don’t need to have a messy garden, or lots of space in order to help the bees. It’s what you do with the space that matters, and a small space can provide food, nectar, and even a place to nest for bees.